The Australian foreign policy establishment has been plunged into an agonising debate with the gradual realisation that Canberra’s long-standing hardline approach to events in Fiji has failed. The bipartisan consensus between Labor and the Coalition that the diplomatic cold shoulder and targeted sanctions would eventually bring the Bainimarama regime to heel has been shattered. And now a high-level public split has emerged that would have once been unthinkable between foreign minister Kevin Rudd and the most prestigious Australian think-tank on Melanesian affairs – the Lowy Institute. The head of the Institute’s Myer Foundation Melanesian program, Jenny Hayward-Jones, is a former diplomat who once shared Rudd’s enthusiasm to use every means, short of withdrawing humanitarian assistance, to bludgeon Frank Bainimarama into an immediate restoration of democracy. But while Rudd is sticking to his guns – testily arguing that it is Bainimarama who has to change, not him – Haywood-Jones now accepts publicly that the tough love approach hasn’t worked. In The Australian and elsewhere, she’s been calling for a new policy of engagement to help Fiji comply with Bainimarama’s long-stated intention to hold elections in 2014. It’s a humiliating about-face that has arguably come far too late. Fiji has new friends and – judging from its recent criticism of Rudd’s alleged intransigence – doesn’t seem to care as much about re-engaging with Australia as some Canberra beltway insiders imagine. Australia grossly underestimated Frank Bainimarama on two crucial fronts. One was his resolve to enforce his own version of tough love – to end the entrenched racism that has bedevilled Fijian democracy with an enforced period of dictatorship leading to fresh elections on the basis of one man, one vote for the first time. Canberra has never fully grasped that the local version of democracy Bainimarama removed at gunpoint in 2006 wasn’t true democracy at all but a bastardised version that gave the indigenous Fijian majority a mandate to permanently disadvantage the 40 per cent of non-indigenous citizens. That has made the moral case for an early poll without fundamental change much less than convincing to anyone prepared to examine the facts. The second mistake was to overlook the capacity of Australia’s smaller neighbour to outwit and outgun it in both regional and global forums. Far from being the Pacific pariah Australia has tried to cast him as, Bainimarama is the current chair of the Melanesian Spearhead Group, the ceremonial figurehead of a regional body that represents the overwhelming majority of Pacific islanders. Yes, the long-established Pacific Forum has more members -including Australia and New Zealand – along with a parade of Polynesian and Micronesian mini and micro-states. But take out Australia and New Zealand and who really speaks for most people in the islands? The MSG, which represents the biggest populations -Papua New Guinea and Fiji -plus the Solomons, Vanuatu and the Kanaks of New Caledonia, who are increasingly independent of their French colonial masters. Two years ago, Australia and New Zealand used their diplomatic strength in the Pacific Forum to muscle Fiji out, even as Suva continues, somewhat bizarrely, to host the Forum Secretariat. Yet now, the so-called pariah Bainimarama sits at the apex of a group that was designed to compliment the Forum, not compete with it – as it will inevitably do under his leadership. Never mind the fault line that’s now become a chasm between the Melanesian “big men” of the MSG and the Polynesians aligned with Australia and New Zealand in the Forum. The MSG chair is sorely alienated from the Aussies and Kiwis and has a new and much more soothing voice in his ear – the Chinese. Ever looking for avenues of influence, the emerging global superpower has strongly backed the MSG to the extent of funding its secretariat in the Vanuatu capital, Port Vila. Simultaneously, Beijing has stepped up its support for Bainimarama’s regime with a string of development projects specifically aimed at tying Fiji more firmly to Beijing’s apron strings. This is what is ringing alarm bells in Canberra and driving its volte face, the dawning realisation that isolating Fiji has not only been pathetically ineffectual but has been utterly counter-productive in giving the increasingly more assertive Chinese a stronger foothold on Australia’s back door. Australian policy makers were in denial about this strategic threat for a long time, absurdly running the line that Beijing wasn’t seriously interested in Fiji. The rapid rise in the number of ducks being consumed in the Chinese restaurants of Suva suggested otherwise, not to mention Bainimarama’s frequent visits to Beijing and his fulsome praise for its assistance to Fiji. Yet this is only half the story. Because the real strides for Fiji in recent months have come from a massive broadening of its support base in the wider international community. Small nations like Fiji may be economically disadvantaged but their vote at the United Nations is as valuable as any other country that’s not a permanent member of the Security Council. Bainimarama saw the opportunity and seized it, hiring a triple Australian-New Zealand- Fiji citizen, Peter Thomson, as his UN ambassador with a brief to break out of Fiji’s traditional orbit and forge new relationships. Fifteen months into the job, Thomson has launched formal diplomatic relations with 33 countries thus far, accompanied by painstaking explanations that the dictatorship he represents is merely a necessary prelude to a more inclusive democracy. This push culminates in Fiji being formally accepted into the 118-nation Non Aligned Movement later this month, bringing it even closer to NAM members like India and Indonesia. Last month, Bainimarama opened Fiji’s first embassy in Jakarta and has accepted an Indonesian offer to assist it to prepare for the 2014 election. In stark contrast to the public comments of Australian politicians, Indonesia’s President, Susilo Bambang Yudhoyono, gave explicit support to Bainimarama’s so-called election roadmap. He said Fiji needed a home-grown democracy that would be sustainable. “Democracy is a process, not an event, and certainly cannot be created through external dictate”, Yudhoyono said. Ouch. Even former Australian foreign minister, Alexander Downer, concedes that Peter Thomson has been highly effective in pressing Fiji’s case at the UN and undermining Australia’s position. Canberra’s long cherished ambition is for a temporary seat on the Security Council. Yet as Downer puts it: “ Fiji is working day and night in New York trying to sabotage our Security Council campaign. Rumour has it that they are having some success”. It wasn’t meant to be like this, the minnow out manoeuvring the whale. Jenny Hayward-Jones at the Lowy Institute is now calling on Australia to “build and lead a new coalition with traditional partners ( New Zealand, Japan, the US and EU) and non-traditional partners ( such as Indonesia, India, South Korea and Papua New Guinea) to work with Fiji on a package of assistance for electoral and constitutional reform consistent with Fiji’s 2014 election timetable”. In other words, let’s help Bainimarama achieve what he’s consistently said he would do all along. And let’s lead a coalition that includes a number of countries already working with Fiji quite happily without Australian “leadership”. This is the bankrupt nature of Australian policy towards Fiji. First the moralising and hectoring, the overt attempts to damage the country and its economy, the dawning realisation of failure, the inevitable rollback, capitulation and the fantasy of leading from the front when events have long overtaken you. Fijians of all races are entitled to wonder what on earth the last four and a half years have been all about when it comes to Australia. Except that the regional bully, not the local dictator, ended up with the bloody nose. This article has subsequently appeared in The Australian, The Fiji Sun, Pacific Scoop New Zealand and other Asia-Pacific websites. Postscript: The Lowy Institute’s concern about China’s influence in Fiji has been rubbished in the Australian media by Dr Jon Fraenkel, a Melanesian specialist at the Australian National University. He said The Institute was “scare-mongering” as most Chinese involvement was about advancing China’s commercial interests. We’ll leave it to readers to judge for themselves from the following Wikileak US cables released in New Zealand two weeks ago. In them, a NZ diplomat describes deals signed between China and Fiji as “massive”. They also reveal a degree of Chinese subterfuge when dealing with Australia and NZ. Classified By: Minister Counselor for Political Affairs Aubrey Carlson. Reasons: 1.4 (b) and (d). On the eve of PRC Vice President Xi Jinping’s February 8-9 trip to Fiji, Australia and New Zealand expressed concern to the MFA that such a visit would send the wrong message in light of international efforts to urge the government in Suva to carry out democratic reforms, according to Beijing-based Australian diplomats. The MFA downplayed the Xi visit, calling it a transit stop on the way to Latin America. 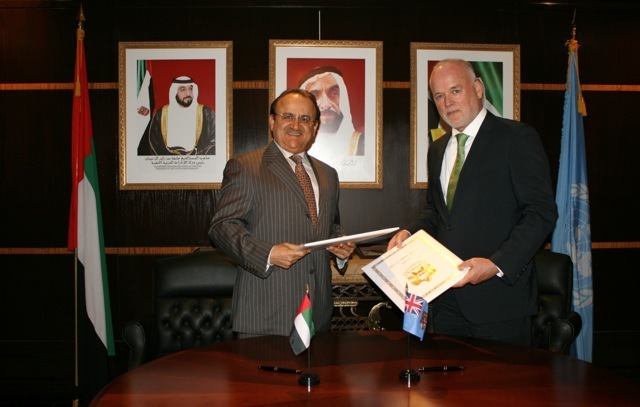 In the event, however, the two sides signed new develop assistance agreements during the stopover, further frustrating the Australians and New Zealanders. 2. (C) Australian Embassy Political Officer Gedaliah Afterman (protect) told PolOff February 11 that the ambassadors of both Australia and New Zealand demarched the MFA separately to express concern that Vice President Xi’s February 8-9 visit to Fiji would set back international efforts to persuade the leadership in Fiji, who came to power after a coup in 2006, to reform. The Australian Ambassador told VFM He Yafei that China should join international efforts led by the Pacific Forum to push Fiji toward democratic reform, but instead it seemed that China was using the opportunity to deepen ties with the country just when other countries were pulling back. 3. (C) According to our Australian colleague, VFM He responded that Vice President Xi’s visit would only be a transit stopover on the way to Latin America. As it turned out, however, China signed several development assistance deals in Fiji during the visit, and Xi met with President Iloilo and Prime Minister Bainimarama. While Afterman suggested the value of the development deals was more symbolic than economic, he said that Australia and New Zealand were frustrated that these agreements and high-level meetings went further in sending the wrong message to Suva. 4. (C) Afterman said that the Chinese sought to obscure plans for Xi’s stop in Fiji by omitting the onward destination of Xi’s aircraft in the Chinese Government’s application to the New Zealand Government to transit New Zealand airspace. He said the Australians were alerted to Xi’s plans shortly before the visit when Chinese officials applied for visas to transit Australia on their way to Suva. 5. 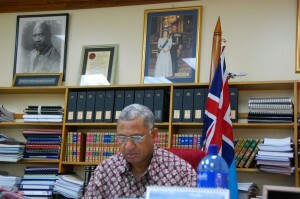 (C) In a February 13 conversation with PolMinCouns, Australian Embassy PolCouns Robert Fergusson (protect) reiterated much of the above and added that his Embassy was awaiting possible instruction to go back to the MFA and complain about the Fiji visit and its more-than-just-a-transit substance. Fergusson said the Chinese were observers at the Pacific Forum meeting at which the difficult-to-reach consensus was developed to push the Fiji Government toward reform. Although not a party to the consensus, the PRC would have known the Xi visit and its results would be contrary to the hard-won Pacific Forum consensus. While Chinese government interlocutors continued to stress the centrality of “non-interference” to China’s foreign policy, a Fijian EmbOff told us a new package of Chinese economic assistance to Fiji announced earlier this year arrived just as western sanctions were proving problematic, and so had a political effect. Fiji remained strategically important for China and Beijing was privately candid about linking development assistance and economic engagement with “guaranteed” political support on issues of interest to China, such as Taiwan, even as the MFA downplayed the importance of checkbook diplomacy given improving cross-Strait ties. According to MFA contacts, western-led efforts to push for political reform in Fiji were part of Fiji’s underlying problem. China, as a developing country and regional leader, had unique insights into Fiji’s political needs. According to a New Zealand EmbOff, the Chinese understood the political risks of being seen as undermining western sanctions, and had taken steps at damage control with Australia and New Zealand. 2. (C) MFA North American and Oceanian Affairs Division Deputy Director Zhou Jian told PolOff May 27 that Fiji was a friend and reliable partner as well as a regional leader with strategic importance in the South Pacific, a region rich in small-country UN votes. Warm relations between the two countries were undergirded by the history of Fiji’s relatively early diplomatic recognition of the PRC and continuing strong ties throughout the series of coups that beset Fiji in recent decades, including the latest in 2006. Beijing-based Fijian EmbOff Filipe Alifereti (protect) agreed in a meeting May 26 that China viewed Fiji as an important partner, noting that China valued Fiji as a useful transit point and for its proximity to important shipping lanes. Still, he argued, China essentially viewed Fiji as it did resource-rich African nations: a valuable destination for economic engagement but of marginal and possibly declining political utility. 3. (C) Zhou insisted that China’s traditional position of non-interference in the internal affairs of other countries guided China’s Fiji policy. He stressed that since the 2006 coup, China had maintained its position emphasizing stability and economic development while urging the Fijians to work together to resolve their political problems. He claimed that the PRC had maintained constant contact with the military government and had urged them to continue dialogue with donor countries such as Australia and New Zealand. He insisted that maintaining social stability and economic development in the island nation was the common goal of all parties, including the U.S. and China. He suggested that western powers were compromising Fiji’s sovereignty by pushing for political reforms, and stressed the importance of understanding Fijian culture and its emphasis on consensus-building. He highlighted China’s engaged but low-key approach toward Fiji in the context of the Pacific Island Forum (PIF). He insisted that China did not seek to establish a “sphere of influence” in the South Pacific or undermine third countries’ interests there. 5. (C) Alifereti asserted that there was little need for the Chinese to push directly for political support from Fiji on issues of Chinese interest, because such support was “guaranteed” and China’s interests were well-understood by Suva. He indicated that such political support was a simple consequence of the enormous economic influence China had on the island. In addition to assistance, trade and investment ties, the Chinese government was providing Fijian government officials with training on a range of skills in China, Alifereti reported. This included training military officials, a practice that began after the 2006 coup, he added. 6. (C) Zhou told PolOff that China had signed at least four economic agreements with Fiji during Vice-president Xi’s controversial February transit stop in Fiji on his way to Latin America (reftels), but insisted that the MFA had few details of the deals. Repeating claims that the transit stop was “nothing special” and arranged out of mere convenience, he reported that one of agreements was a 10 million RMB grant but the details of its use were still under discussion. Zhou insisted that China was providing “project assistance,” and not simply cash. He noted that during Premier Wen Jiabao’s 2006 visit to Fiji China announced deals worth almost 400 million RMB to Fiji as a part of a larger package of aid to the South Pacific, but the execution of these funds had been bogged down by political turmoil in Suva. He denied media reports that China had doubled its assistance to Fiji in the three years since the coup, insisting that Chinese aid had remained level or declined since 2006. He expressed Chinese frustration with the inability of the Fijians to move forward with the grants, noting that MOFCOM was awaiting a list of projects the regime would like to see implemented before initiating a feasibility study. 7. 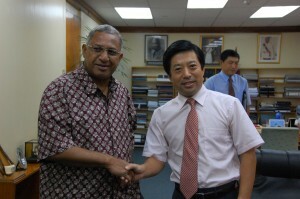 (C) Alifereti acknowledged that China’s economic engagement was growing at a time when Fiji needed the support. While skirting the issue of Australian and New Zealand-led efforts to isolate the regime in Suva, he did point to a planned UK investment in the sugar sector that was recently dropped due to the political situation in Fiji as evidence of economic sanctions causing concern for his government. In light of those concerns, Alifereti applauded the “good timing” of the soft loans announced during Xi’s stop-over. 8. (C) Alifereti explained that Chinese cash was flowing in just as traditional sources of income were drying up. A recent drop in remittances from Fijian troops serving in UN peace-keeping operations occurred at the same time that Chinese tourism to the island was growing quickly due in part to a new China-Fiji air service agreement and a relaxation of Fijian visa regulations for Chinese visitors. Alifereti also noted that Chinese goods, which used to come through Australia and New Zealand at a heavy premium, had been flowing directly to Fiji thanks to direct shipping routes opened in February 2008. 9. (C) Through this range of development assistance and soft power programs, Alifereti suggested that the message to Fiji was clear )- the Chinese development model had brought huge success to China without any need to institute political reform. He asserted that Fijian culture resembled China’s in the sense that both maintained that political problems should be solved “internally” and that Fiji was “not fit” for competitive politics. Zhou from the MFA agreed, stressing the “consensus-building” nature of Fijian culture and China’s unique ability to understand this. 10. (C) MFA’s Zhou denied that China sought to take advantage of western efforts to isolate the regime in Fiji, underscoring China’s desire to cooperate with the United States, Australia, New Zealand, and others on development assistance to Fiji and other less developed countries (LDCs). He stressed that Chinese assistance to Fiji had been in place since the establishment of China-Fiji relations and that no new projects had been begun since the 2006 coup. Zhou denied that this aid hiatus was due to the coup, but rather reflected the difficulties of working with the Fijians on the ground. While some Chinese projects in Fiji continued, Zhou insisted they were projects that were contracted before the 2006 coup. He admitted that China remained inexperienced as a donor nation, and offered that the MFA could cooperate on the ground with the United States and other donors. Zhou noted, however, the MFA’s relatively low-profile role in providing assistance, compared to MOFCOM, which had the lead on foreign assistance. 11. (C) Zhou asserted that, with the recent thaw in cross-Strait relations, China’s policy in the South Pacific was looking past its traditional focus on checkbook diplomacy to buy UN votes to shore up its claim to Taiwan, and the Taiwan issue had become “less of a priority” in Chinese foreign policy with the South Pacific. PRC Knows It Went Too Far? 12. (C) Embassy of New Zealand PolOff Tara Morton observed that, since interventions by Australian and New Zealand officials, including at the Prime Minister-level, the Chinese appeared to have been “shamed” by the Xi Jinping transit. She add that their MFA contacts assured them that such lack of coordination on regional issues would not happen again. She stressed that the value of the deals signed in the transit was “massive” and potentially very destructive given the poor capacity of small South Pacific nations to repay large loans, and the value of the new assistance had obviously been underplayed by Beijing. She added that the PRC had been candid with New Zealander interlocutors in linking Fijian support on the Taiwan issue to China’s development assistance there. I found Ms Hayward – Jones’ latest comment to her critics on the furore her paper had stirred up very instructive. It indicates the importance of not taking things at face value, the importance of not putting one’s own spin on the perceived actions of another and, equally, the importance of making a written statement clarifying one’s position if that position seems to have been misinterpreted. I wish there were more commentators like her. Interesting commentary and recommendations by JHJ. And it was good to see that her views expressed in this paper were entirely her own and not those of the Lowy Institute for International Policy.As the saying goes,’To each each own”.